A new cancer treatment strategy is on the horizon that experts say could be a game-changer and spare patients the extreme side effects of existing options such as chemotherapy. Chemotherapy and other current cancer treatments are brutal, scorched-earth affairs that work because cancer cells are slightly – but not much – more susceptible to the havoc they wreak than the rest of the body. Their side effects are legion, and in many cases horrifying – from hair loss and internal bleeding to chronic nausea and even death. But last week the Food and Drug Administration (FDA) for the first time approved a single treatment that can intelligently target cancer cells while leaving healthy ones alone, and simultaneously stimulate the immune system to fight the cancer itself. An engineered herpesvirus that provokes an immune response against cancer has become the first treatment of its kind to be approved for use in the United States, paving the way for a long-awaited class of therapies. On 27 October, the US Food and Drug Administration (FDA) approved a genetically engineered virus called talimogene laherparepvec (T-VEC) to treat advanced melanoma. Four days earlier, advisers to the European Medicines Agency had endorsed the drug. The strategy builds on a phenomenon that has been appreciated for more than a century. Physicians in the 1800s noted that their cancer patients sometimes unexpectedly went into remission after experiencing a viral infection. These case reports later inspired doctors, particularly in the 1950s and 1960s, to raid nature’s viral cupboard. Clinicians injected cancer patients with a menagerie of viruses. Sometimes the therapy destroyed the tumour, and sometimes it killed the person instead. Unlike the wild viruses used in those mid-twentieth-century experiments, some of today’s anti-cancer viruses are painstakingly engineered. T-VEC, for example, has been altered to drastically reduce its ability to cause herpes. 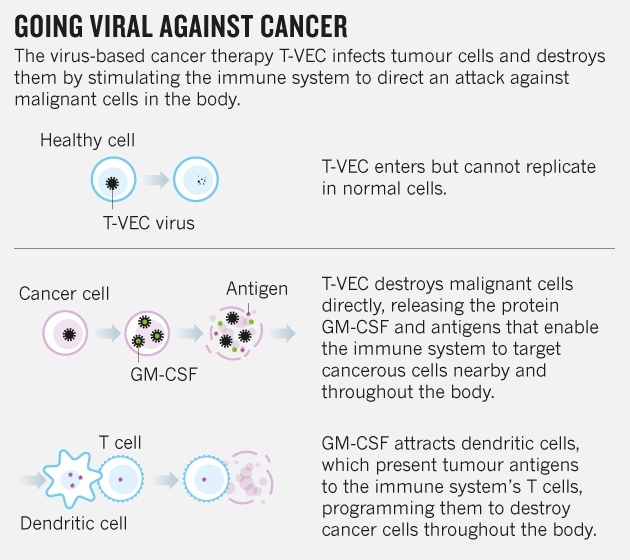 Researchers also inserted a gene encoding a protein that stimulates the immune system, which makes the virus even more potent against cancer (see‘Going viral against cancer’).